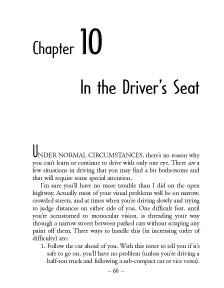 This chapter deals exclusively with the pitfalls of driving and how to avoid them. One of the most difficult aspects of driving is parking. Mr. Brady confides that this is one aspect where he could not regain the confidence he had before his eye loss, but he does offer some useful tips. "I have developed a trick or two that you can use for snuggling into your own garage without hitting the rear wall. Turn on the headlights, even in daytime and watch the pattern the beam makes on the wall as you approach it. A curved line of light moves downward as you approach the wall. By putting a marker, a piece of tape for example, you can stop the car just as the line of light reaches the marker. I use this little trick on a daily basis and find that it is very precise. I can stop the car so the front bumper is within an inch of the desired distance from the wall. (pg. 66)"